Tea, coffee and bacon sandwiches were the order of the day as the DJs arrived, feeding their brains for a full day of interesting and engaging seminars covering a wide variety of different topics. 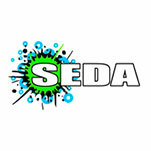 Featuring speakers with a wide-range of knowledge and experience, the SEDA committee had put together a programme designed to be useful for mobile DJ at all levels. Euan Bass started the day with an interesting presentation on how DJs can use background music at the start of an event to get referrals! He explained why he thinks that this often-overlooked part of the evening, where the status quo is usually to “stick a Grandmaster on”, is actually the time when a DJ is under the most scrutiny. Tapping into the psyche of guests at a party, and playing music that appeals to them before the evening party officially starts, is a great way for DJs to show their music selection skills, which could lead onto future business. 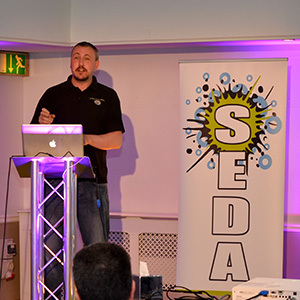 Second-up was SEDA Chairman, Ian Forest, who shared a 3-step sales process designed to help individuals work out who they are as a DJ before leading onto the definition of their ideal client. A quick brainstorming session with the group resulted in a blueprint which could then be used to target any website and marketing content directly at that demographic. From there Ian touched on the different tools available to present that content as well as explaining some useful conversion techniques. After a hearty carvery at the hotel, it was time for the gathered DJs to knuckle down and get their brains in gear for an open discussion on digital marketing hosted by Barney Grossman. Some time was spent on Google Analytics and how it can be used to work out exactly who is visiting a website, where they are coming from and what they do on the site. Barney then looked specifically at some of the group’s websites and offered ideas they could use to improve their site, both from a visitor’s point of view as well as based on how search engines like Google look at it. Finally, the DJs in attendance were treated to an exclusive seminar from Adam Hetherington who over the past several years has spent time on both sides of the decks, not only working as a DJ but also as an event supplier. He suggested really simple things all DJs can do to improve their perception to everyone involved in the events industry from venues to photographers. He covered everything from how a DJ drives their vehicle into the car park, to how they dress, walk and interact with venue staff and other suppliers. A very interesting presentation, it certainly captured the attention of all the DJs in the room!